Gardeners clearing or walking in long grass or bracken around the garden should watch closely for ticks when they undress at the end of the day. At first, a tiny tick can be as small as a speck of soot and not easily noticeable but the longer the tick remains unnoticed, the greater the risk to the host from Lyme disease. 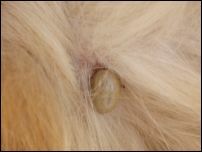 Risk for a carrier of tick is heightened if the tick remains un-detection. A tick bite can be painless and if the tick is left to feed on a carriers blood then the risk of disease increases and infected ticks can pass the bacterium, Borrelia burgdorfer, into the bloodstream. Lime Disease Action has an extensive website thoroughly explaining the dangers of ticks. A great starting point is the frequently asked questions section. If you work or live or perhaps walk your dogs in areas that are favoured by ticks then it is worth researching the dangers. Understanding what Lyme disease is, how to diagnose it, what are the symptoms if you have Lyme disease and how to treat it. Lyme disease is certainly not new and was known to have been around in Victorian times but cases are becoming more frequent. Ticks are no less a problem around the World, with all the advanced counties having advisory websites. In Australia, the Paralysis Tick - Ixodes holocyclus poses great danger with 100,000 domestic animals affected by tick bites. Tick bites are said to pose a greater danger to children than snakes or spiders. In the United States, cases of Lyme disease have risen from an approximate 10,00 cases in 1992 to circa 27,000 in 2007. This map shows how the majority of cases are in the North-East of the US. Here in South-West France it remains fairly mild and only this morning I have found a fairly well advanced tick that had been gorging on the blood of our little sheep dog Cookie. Cookie is fairly well protected by an extremely thick coat and when ticks are small, they are difficult to spot. For some reason, although she is brushed regularly, this critter went undetected. We have many articles on how to deal with tick bites and other Lyme related issues. We have a huge database on Lyme symptoms, treatment, diagnosis and prevention. I recently wrote an article on my blog about making a tick trap. Simple items like cardboard, dry ice and spray glue or even tape will hold them. Very interesting map. I have noticed an increase in ticks in southern Maine within the last few years. Thanks for your comment Dwayne. I am intrigued to discover what a tick trap comprises of.